On August 28, 1963, Dr. Martin Luther King, Jr., gave the closing address at the March on Washington, a civil rights event in Washington, D.C. The March on Washington is probably best remembered for its closing speech, delivered by Rev. Dr. Martin Luther King, Jr.—"I Have a Dream." 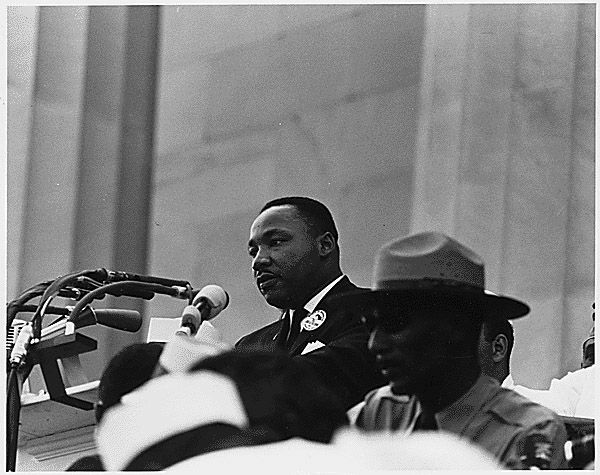 On August 28, 1963, Dr. Martin Luther King, Jr., gave the closing address at the March on Washington, a civil rights event in Washington, D.C. His speech, delivered in front of a crowd of 250,000 people, became famous for its recurring phrase “I have a dream.” Calling Americans to a future in which “the sons of former slaves and the sons of former slave owners will be able to sit together at the table of brotherhood,” King’s rhetoric defined the civil rights movement and was quickly acknowledged as the greatest speech of the century. Martin Luther King, Jr., was born in Atlanta, Georgia in 1929. Like his father and grandfather, King studied theology and became a pastor in the Southern Baptist church. In 1957, he was elected president of the Southern Christian Leadership Conference (SCLC), one of the leading organizations of the civil rights movement. In this role, King promoted civil disobedience and non-violent resistance: sit-ins, marches, boycotts. He also delivered more than 2,500 speeches, and was arrested at least 20 times. For his work and promotion of peaceful methods of protest, King won the Nobel Peace Prize in 1964. On April 4, 1968, King was shot and killed while standing on the balcony of his hotel room in Memphis, Tennessee. spiritual leader of a church. (Southern Christian Leadership Conference) civil rights group often associated with Dr. Martin Luther King, Jr.
study of religion, faith, and spirituality.